You know that feeling when your BFF is sick and you just want her to feel better so you can play together again? Yeah, this cat has that. Check him out as he gently licks his sister's head to help her recover. That's true love right there. AriMiU on Instagram: "#arimiulovelovecat #cats #catlover #catvideo #catstagram #instacats #instagood #love #socute #arang #happy"
These cats are named Arang and Happy, and you can see lots more of them on their Instagram account. Their adorable relationship goes all the way back to when they were rescued together as kittens, along with two other siblings, after being found abandoned in a parking lot in South Korea. AriMiU on Instagram: "#Arang #Happy #kitty #kittens #cats #catlover #catstagram #instakitty #instakittens #instacats #catrescue #soadorable #sobeautiful..."
The kitties live with the two sisters who rescued them - and now their day-to-day adorableness is captured on Instagram for all to see. AriMiU on Instagram: "#Arang #Happy #kitler #kittymeow #kittens #adorable #animals #animalphotos #socutestagram #meow #instakitty #instakitten #catlover #love..."
Arang and Happy have grown up together, so it makes total sense that they would want to look out for each other when they're sick, too. And clearly, cuddling has always been a crucial part of their relationship. 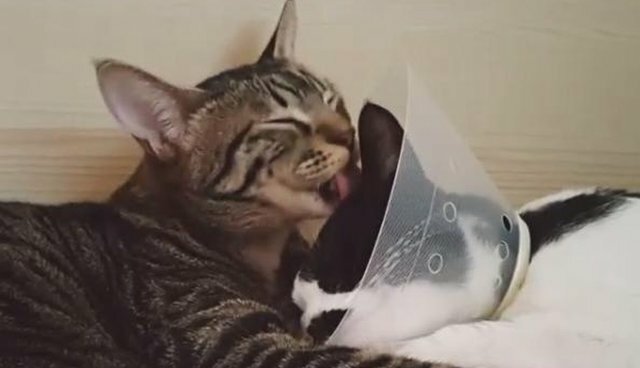 AriMiU on Instagram: "#Happy #Arang #kittens #cats #kittymeow #catstagram #instacats #ilovekitten #ilovemycat #kittensofinestagram #kittenstagram #socute..."
There's no doubt that Arang's kitty kisses will help his sister recover faster - after all, cat love is the best medicine.